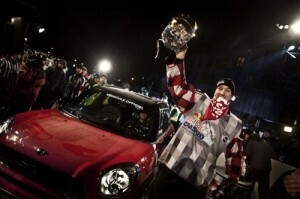 The wait is over: On Saturday, March 19th, the Red Bull Crashed Ice (RBCI) Champion was chosen in Québec City, Canada. 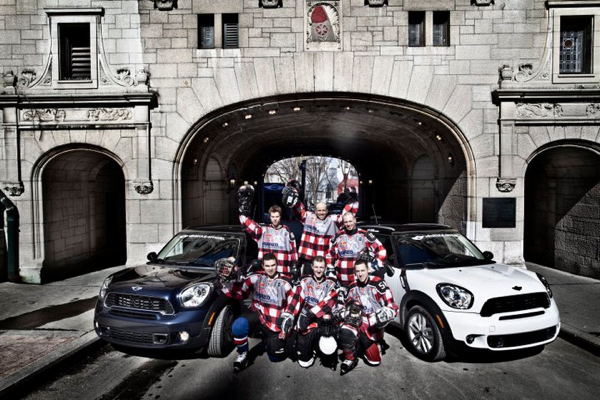 MINI Canada was the official automotive partner of the Red Bull Crashed Ice World Championship for the second time this year. Arttu Pihlainen is the new Red Bull Crashed Ice World Champion after securing his third successive victory in front of 110,000 fans in Quebec City. MINI Canada also awarded the best newcomer with the MINI Rookie Award – a prize given to the fastest newbie on the course. More than 120,000 spectators turned out to watch this year’s event. The award went to the top ice-racing newcomer in each of the four international events Canadian Philippe Poirier. He became the fourth winner of the MINI Rookie Award after finishing 28th in Saturday’s (March 19th) race. The four award winners then got the chance to race the streets in a new MINI, in addition to receiving an impressive trophy. MINI is particularly committed to fostering up-and-coming athletes and therefore introduced the MINI Rookie Award at the 2011 competition. MINI is reaching out to a young, sporty, lifestyle-oriented target group with its involvement in unconventional winter sports. While innovative concepts, originality and the right feeling for speed and curves are at the heart of the action at the RBCI World Championships, the MINI brand’s latest models are also in their element. In addition to highlighting the best newcomer, MINI also provides an athletes’ shuttle services with MINI Countryman for the Red Bull Crashed Ice World Championship, so every athlete has a chance to enjoy the MINI experience. Québec was the fourth and final stop of the Red Bull Crashed Ice World Championship 2011.